Flow is a state of being when a person is fully focused on a task at hand, feels happy and in control, is creative and productive. The time and space (environment) outside of the task cease to exist, past and future drop off the horizon. There is only a happy, glorious, challenging NOW. Tango is ultimate flow-producing activity – the music and interaction within the couple (and with the rest of the floor) require complete concentration, the challenge and creativity are infinite, and dancers are fully in control. All of which leads to a fairly easy conclusion that tango equals happiness. Except it does not. There is a whole lot of frustration out on the pista. Leads upset that the follow is not doing what they are leading when they are leading it. Followers are nervous that they are not doing enough decorations at the appropriate spots in the music. Both partners worried how they look to the spectators, whether they are about to run into another couple, and how much damage is about to be done to their reputation, hairstyle and their partner’s ego if they don’t start on “one”. How do we get from here to the Flow? I do not have a simple answer. “How to experience tango Flow” isn’t a class many instructors offer (although some come close). Yet, as more people join the community, it is important to both learn and teach what it is that makes us happy, creative and productive – or at least feel that way. I feel that a key to achieving flow is to distract the judgmental mind. A truly talented person might be able to self-induce a trance state, though I've found that there I can be too zoned out, so that I don't attend to necessities, such as floorcraft. In earlier days I ran a continual checklist (like a pilot) of things to check on — not judge! — simply noting their state (tension of the embrace, for example) and whether they needed adjustment. I still do that, but to a lesser extent, and in a more refined way. Another idea is to create a story as you dance. Another idea is to be super attentive to your partner's axis. In lessons, where/when it is safe, I've been practicing leading with my eyes closed. It's amazing how different is one's sense of the other person's body. With enough awareness and attention one can bring that same sensation into their eyes open dancing. I'm interested in any other ideas people may have about distracting the judgmental mind with productive or pleasant activites. 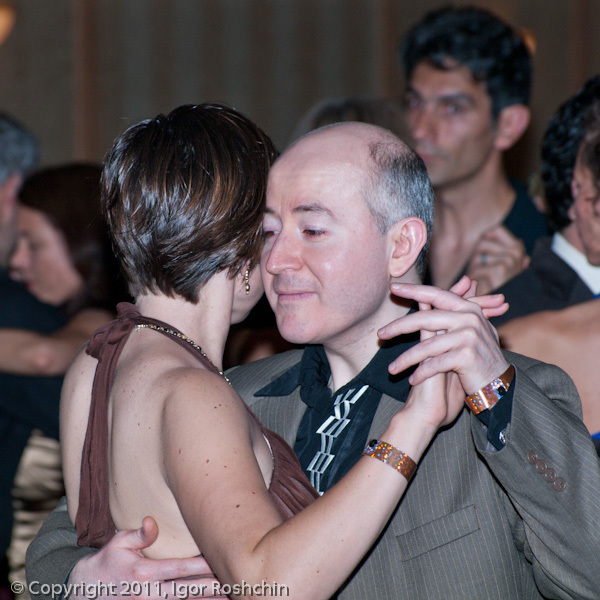 Leading with one's eyes closed sounds interesting; not something I've tried, and certainly not something I would try in a crowded milonga, and I doubt if a partner would find it interesting if I did! But I'll give it a go next time I'm in a practica. When I lead, on a good evening I'm so absorbed in the music, my partner and the floor, that the judgmental mind simply doesn't seem to exist any more. Or exists momentarily; quick checks on the embrace, posture, awareness of surrounding space, of my partner's reaction to the dance. I'm beginning to wonder if this state of flow may be what I believe older BsAs dancers refer to as the 'tango angel', which seems a wonderful description for your guiding spirit when the dance goes really well and you (I) seem to be effortlessly at one with the music, the partner, the floor. Balanced, on the other hand, by those evenings when the tango angel just isn't available, when it's all an effort and that flow just doesn't begin. Or when the tango angel arrives late, after I've struggled through a few hours of dance that just didn't take off! May the tango angel be with you! Superb commentary David, nice addition Tangocommunter, and good article Jane. I was attracted to this article for the quote. I have been interested in the zen of tango, and though I still have so many troublesome dances, I am convinced of the buddhist methodology. The trick about tango, is the centre is not within the person, but between. I believe this is what makes tango so fundamentally deep. It is impossible to get right, in a way, we can only achieve it momentarily, though that moment can extend for an entire dance, and rarely for an entire milonga. I'd be happy to engage others in a conversation, hangout, skype etc, to share our relative experiences on this subtle aspect... how minds meet on the floor. Thanks, David Pinto! I find your Google+ presence interesting. At the moment I'm listening to your happyseaurchin stream of #jaxing on soundcloud. I wonder if you might find MiniDonations.org interesting. I met founder Leo Ramirez when we were working on funding Dance International - a dance, arts, music movement in Austin. I already had you in my "Argentine tango" circle. My personal presence for tango commentary is at tangolio.com. I'd welcome engagement (there, where it's awfully quiet; or elsewhere) on tango, Buddhism, and ancillary topics. The notion of putting one's attention on the center between you and your partner strikes me as a useful image/concept. It feels like putting oneself in a meta position, as an interested observer with a less personal stake (and all the problems that is fraught with) in yourself, your partner, and how it is going. I can also imagine a meta position for observing la ronda, where your attention is not only on the bubble that floats along surrounding you and your partner, but also the disembodied observer floating high above the dance floor observing that flow. Now then a meta position for observing(?)/hearing(?) an auditory-body connection with the music escapes me. Hm...? A meta-position... Curious... I am fond of meta, the superposition with regards to conversations, to talk about the conversation. When tangoing, I hadn't thought about it like that. Give jaxing a go, please! I will even pay to hear someone sharing their continuity of thought! Dave Donatiu had a simple awareness-building exercise in his class: in the middle of a dance, leaders or followers switch their attention away, and begin to watch, intently, someone else on the floor. "Did you notice the difference in the quality of the dance?". This said, some people are Nature-born multi-taskers, and perhaps they could be a dance partner, a conversation partner, and a people-watcher at the same time? My trance-inducing advice for the leads is to behold the music and the beauty of her motion. Yet a state of enthrallment isn't particularly useful if it is purely one-sided. As in, if your partner clearly prefers to dance "in a practica mode", then it may be better for yourself and for your contact and mutual connection to play along, like, yeah, I'm just practicing too. One of the things that will certainly prevent you from getting into the tango flow is getting obsessed with what other people on the dance floor may be thinking or feeling when they are dancing. Perhaps *you* are always thinking about what your dance looks like to onlookers or whether or not you are doing enough decorations to fit the music, but that doesn't mean that other people have the same thoughts and feelings going through their heads as they dance. Many of us don't. To achieve flow, focus on your own dancing, rather than on being judgemental towards others.